TrueStructures™ is a complete system for the exploration of structural engineering topics that involve bending, torsion and combined loads. A variety of test specimens, an I-Beam, tube and wing section, are included. Simple and complex bending, shear and torsion are demonstrated in a progressive fashion using an I-beam, torsion tube, and production aircraft airfoil structure. A durable powder coated main support frame is made from structural steel tubing and mounted on rolling casters for mobility. TrueStructures™ is sized to fit through any standard interior door, making it convenient for both laboratory and in-classroom use. 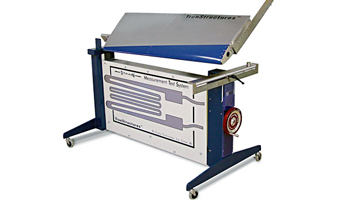 Test specimens are built of commercial-grade aluminum for long life. Industry standard linear and rosette foil strain gauges are strategically mounted on all test specimens. A load cell equipped jack-screw mechanism allows the operator to apply an incremental force to each test specimen. Strain gauge measurements feed a fully integrated and pre-calibrated National Instrumentsdata acquisition system (full bridge completion). The system is configured with extra bridge completion channels, which allows custom placement of additional strain gauges by student experimenters. 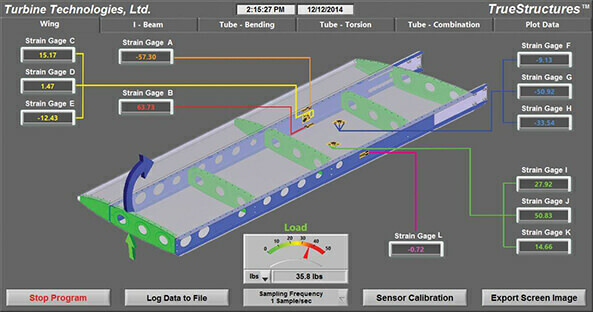 Strain gauge measurement data is sent via USB connection to a LabVIEW generated virtual instrument (VI) panel on the provided laptop computer. This system displays real time data and has interactive operator control. Data can be recorded for future analysis. 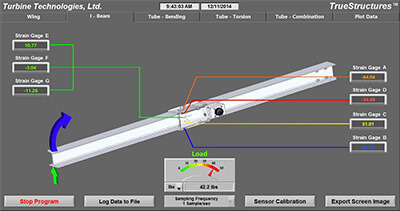 Software strain gauge calibration allows users to load an offset value to each strain gauge, and users can also automatically tare all strain gauges to a zero point for easy on-screen graphing and analysis. The VI source code is provided for student experimentation and modification and supports teaching efforts in areas of modern instrumentation and data acquisition methods. lab. Solid models are also included to show the details of each test specimen, including the internal airfoil structure. These solid models and laboratory procedures are included on CD-ROM. A unique feature of the TrueStructures™ lab is the fully instrumented aerospace component representing real-world hardware. Students are able to simulate aerodynamic and vehicle loads, measure the resulting strains and experimentally determine the stress condition. Students are able to focus on results rather than the implementation. An "open system" design allows unlimited future expansion. The included lab procedures provide step-by-step instructions on the basic operation of the lab.